Accueil Produits Bande originale La bande originale de “6 jours, 7 nuits”. 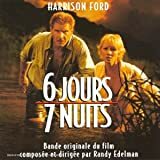 La bande originale de “6 jours, 7 nuits”. Sortie : 9 juin 1998. Film : 6 jours, 7 nuits. 1. Into The Mist – 1:56. 3. Pink Kawala – 1:03. 5. Flating Pontoons – 2:30. 6. Fixing The Old Beaver – 2:58. 8. A Ray Of Hope – 2:11. 9. Quinns Brilliant Idea – 1:30. 10. Saying Goodbye – 1:19. 13. Lunching With Peacocks – 1:52. 14. Subways And Skyscrapers – 3:24. 16. Just A Small Snake – 2:03. 17. End Of A Journey – 1:05. 18. Flying Injured – 1:10. 19. On The Edge – 1:24. 20. Six Days And Seven Nights – 1:52. 21. The Calypsonians – 6:29.